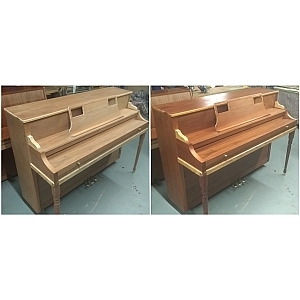 Pianos, Acoustic Pianos , Acoustic Pianos from All Instruments Ltd.
We not only sell pianos, we have a team of specialised technicians who are here to restore, tune and give advice on all aspects of the piano. We also have a piano moving team who deliver and safely move your piano whether you are changing home or just your music room! See our piano services here. Allison Grand Piano in Gold Textured Case! Attractive and unique Allison baby grand - unusual gold textured casework and previously owned by singer songwriter Gilbert O`Sullivan. A real eye catching piece of art as well as a fantastic instrument. Comes with matching stool in the same finish and Gilbert O`Sullivan framed gold disc. A chance to own a true original with fantastic cultural history. This is a beautiful example of a green Chinoiserie style grand piano. A compact baby grand with stunning hand painted birds, figures and floral decor. The pictures showing of the rich apple green finish does not do this piano justice. This is a must see! As well as the luscious casework, this piano has a roller action giving the reliability and controlled touch of this style. We offer a five year guarantee on this instrument so you have piece of mind. Please contact us for any more information required. A beautiful fully restored straight stung Erard grand piano. This 9 foot black polyester concert grand is very special. The bass is amazing and is a must try! This instrument comes with our full 5 year guarantee. 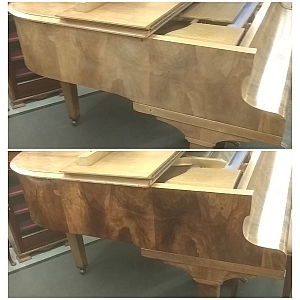 This is a beautiful figured walnut baby grand. The name Marshall & Rose is a good English example who produced fine instruments during the 20th Century. This example is from the 1930`s and has a full Ivory keyboard. We offer a five year guarantee on this instrument so you have piece of mind. This is a very elegant, very clean, bright black polyester baby grand. Compact in size and perfect for any home. This has been tuned and regulated and is ready to go. Please contact us for any more details required. Superb black polyester baby grand. This would look dazzling and be an eye-catching piece of furniture in any home. The tone is ideal for any fine musician and the touch is quite delightful. At this price it`s a must see! Beautiful 88 note polyester cased grand. Rich sounding bass register and clear mid and top range. This Upright has a wonderful full tone with an even touch. The case is in near new condition and appears to have been re-polished in recent years. The action is underdamper and so will be compatible for any pianist. Beautiful Arts & Crafts upright piano in the style of Voisey. Very rare to find such a unique style in such good condition. Original brass candlestick holders and typical Voisey style decorative hinges. This has been tuned and regulated and is ready to go. Overstrung and underdamper action. 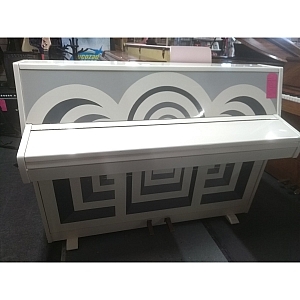 This is a chance to buy a unique cased piano for a very low price! Please contact us for any more details required. A Challen bureau style upright in a sapele mahogany satin case. In good playing order. Monington & Weston upright piano in a chioiserie lacquered case on a scarlet backgrounf, decorated with figures in a garden landscape; together with a matching stool. This is a beautiful fine sounding instrument with a stunning dark red mahogany polyester finish. The action is pristine and the sound is delightful. A traditional colonial style upright piano in a rich american walnut satin finish. Huge bass sound. This Legnica upright has a pale polyester Sapele Mahogany case. Comes with 3 pedals so you can practice with ease if you decide to use the quiet celeste felt pedal. This is a bargain at this price! Buy it now! This exquisite Monington & Weston upright piano is a rich mustard yellow. Sadly the pictures do not do it justice. The piano shows off some elegant hand painted chinoiserie style pictures of landscapes and figures on a yellow background. This comes with an equally stunning matching decorative piano stool. The action is underdamper and in fine condition. The strings are overstrung and produce a beautiful sound. 6 octave Opus pianino upright piano in a mahogany style modern case. These little gems make great instruments for the smaller space. A compact piano with a great sound! Beautiful but compact, warm satin walnut Schimmel upright with a wonderful tone, as expected from such a fine German instrument. This piano comes with our 5 year guarantee. Great Mahogany traditional upright with beaded 3 panel top door for a bargain price! This piano is checked, cleaned, tuned and restored by our highly trained technicians before leaving the store, for your piece of mind. Steinhoven Upright - Brand New! 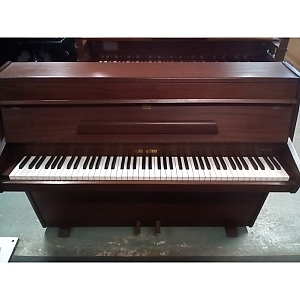 Beautiful British made piano with exceptional dark mahogany case,88 note keyboard and three pedal assembly.Early viewing recommended. 7 octave upright in a beautiful walnut cabinet in original finish. Plays well and a surprisingly good bass for such a compact piano. Compact 85 note Zender upright with surprisingly rich tone. With a Two pedal assembly, over strung action, and a tidy mahogany case this little upright is perfect for beginners and mid range players. This small upright is very compact and neat. The casework is a tidy teak finish and has a satin finish. The tone, as always on a well looked after Zender is full and rich for such a small piano. The touch is even and seems very easy to play. This involves stripping off all of the old finish and colouring and finishing to a satin sheen. 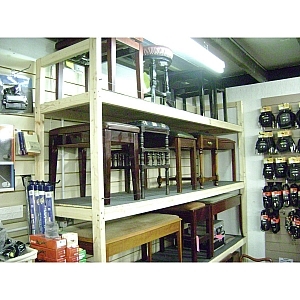 We also clean out the piano, clean up all the brasswork and screws and fit new nameboard and pedal felts. Transport costs can be found in our delivery section at the top of the page. 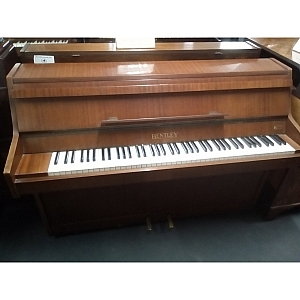 A Bentley 85 note upright piano with light mahogany casework. This repolished and overhauled Boyd upright piano has new hammer heads and damper heads. It is British made and has a magnificent bass. A traditional dark mahogany cased piano in good order. Comes with a guarantee - as do all our pianos. Beautiful figured walnut Art Deco casework in a satin finish. A lot of piano for under a thousand pounds! A sleek modern looking but traditional in shape new piano in black with funky chrome fittings. This BRAND NEW Ritmuller upright is superb across the range. A great sound, a five year guarantee for peace of mind and a good action performance give this piano a heads up above most. At a very affordable price as well. 1920`s Mahogany cased upright piano. A fabulous sounding German piano in very good order. Comes with a 5 year guarantee. Overstrung and underdamper, this piano performs with the best of them.